Super Bowl, the ultimate American football celebration, is just around the corner and Intertops Casino is adding to the excitement by giving away $85,000 in bonuses. In a special draw 12 players will be awarded $200 - $500 bonuses. Every week until then, 200 players will receive bonuses up to $250. To further feed the football frenzy Intertops Casino presents the classic computer game, Ultimate Football, which its players can play for free this month. Football fans will enjoy playing Ultimate Football between casino games. Ultimate Football is a classic computer game where players throw as many footballs to their teammates as they can before the clock runs out and for a limited time it’s available free at Intertops Casino. Intertops Casino players that follow American major league sports can use their Intertops account to place bets on NFL, NBA and NHL games. 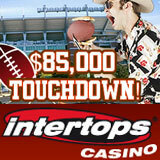 One Intertops Sportsbook player will win a trip to Super Bowl XLV in Texas. One of the world’s oldest and most trusted US-friendly online casino, Intertops Casino has more than 300 instant-play and download casino games to choose from including 3 and 5 reel slots, multi-hand video poker, and traditional casino favorites like Blackjack and Roulette. In daily slots tournaments Intertops Casino players can play against other players on some of the site’s most popular slot machines. Intertops welcomes players from around the world and is known for quick, hassle-free deposits and withdrawals and excellence in customer service. Super Bowl Tailgate Party Bonus details and Scoreboard (updated daily) are available at: http://casinopromotions1.intertops.com/football.html.